I just didn’t think I could be surprised by a bowl of pasta and tomato sauce. I’ve been cooking for more than 50 years, and I was pretty sure I had seen about every variation on pasta and tomatoes that was worth tasting, and especially simple dishes that could be prepared quickly on a hot summer evening with a minimum of fuss and with familiar flavors I’ve used or tasted a thousand times. When I was single, I would boil a big handful of pasta, throw a chopped clove of garlic, a couple of basil leaves, a plum tomato and some onions into a sauté pan heated with olive oil, toss them together with some Parmesan, pour a glass of Chianti and call it dinner. This is still probably the best simple dish I know. So when we were directed to the large bowl of warm linguine and tomatoes at a party a few weeks ago, I nodded politely, said “Thank you” and headed for the Thai spring rolls. Some time later, out of curiosity — and because the pasta in the large bowl was dwindling rapidly and I didn’t want to feel left out — I tried the pasta. I discovered what I think pasta and tomatoes is supposed to taste like. When that first Italian farmer, three thousand years ago, accidentally spilled his harvest into a bowl of noodles, this was what he experienced. And we’ve all been trying to replicate it ever since. This is Zen in the kitchen: The only cooking is boiling the pasta, and it requires very few ingredients, most of which you already have on hand. Many people grow their own tomatoes and basil, but if you don’t, try it next summer. It’s the easiest way to start growing your own food. You’ll save money on oft-used staples, and ingredients you grow yourself make any recipe better. The dish began as “Linguine with Tomatoes and Basil” in The Silver Palate Cookbook, and it uses softened Brie instead of the more common Parmesan. I was most surprised by that. I’ve never used Brie in a recipe. To me, it’s bland and uninteresting. But what a difference it makes! It’s about texture, and it beautifully carries the other, bolder flavors. I’ve sharpened and altered the recipe to make it, I think, even better. It has less oil, more veggies, and a more intense flavor. And use rotini, which holds more of the sauce and is available in a protein-enriched variety in most grocery stores. 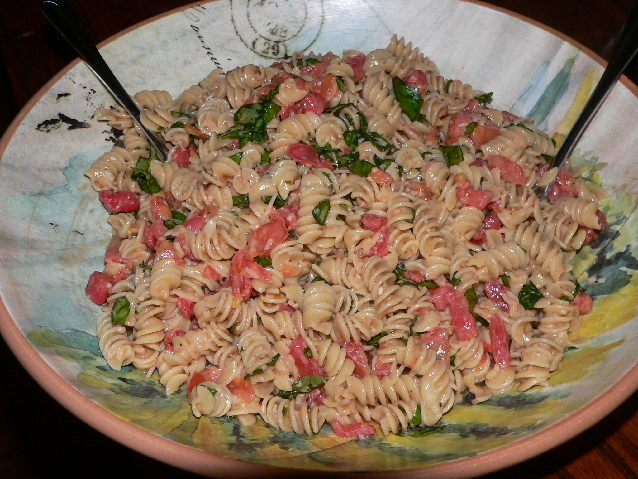 Combine the tomatoes, cheese, basil, garlic, 1/2 cup olive oil, 1 teaspoon salt and pepper in a bowl. Mix well. Cover and let stand at room temperature for two hours. Boil the rotini in water with the remaining salt and olive oil until just al dente. Drain the pasta well (but don’t rinse it — you want the pasta starch in this dish) and immediately combine with the tomato sauce, tossing well until the cheese melts into the pasta. Serve immediately with warm, crusty bread and a bold Italian red wine. Have a pepper mill at the ready. Right now is peak tomato season, and you can’t possibly have enough different and wonderful recipes using these garden treasures. On vacation last week, we rediscovered panzanella, an extraordinary tomato, basil and bread salad, one of my favorite summer dishes. You can find my recipe for this treat in the Aug. 8, 2010, edition in the LancasterOnline archive, or on my blog.